5-1/2" 30lb tensile strength #8 screw. 8" 50lb tensile strength #10 screw. 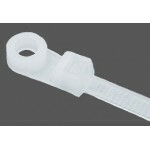 Product Code: Cable Ties Natural w/Mounting Head 100 Pcs.